I'm assuming this is a straight port, so Arcade scores could be included as well. 9. Kiel - 440,587,000 - All - ? 13. Kiel - 760,261,220 - All - ? Last edited by gavin19 on Sun Nov 18, 2018 4:31 pm, edited 92 times in total. Please open rankings for the two additional modes. Thanks. That's some serious scoring. I haven't even topped 500 million yet. Ironically I find hard mode easier than normal; mostly I think because of a lot more 'cancelable' bullets therefore DFS meter gets filled quicker. I did actually manage to complete an All Clear on Hard, however, I didn't actually kill the 4th or 5th boss (both timed-out on me) and I didn't meet the requirements to face the TLB. The score was actually lower than my one above. Well congrats. I'm still stuck on Stage 4 boss on both Normal and Hard. I thought this would have been like Radilgy in terms of difficulty but it jacks up quite steeply after stage 3. Came today, shot through once on Easy just to try it out. Well-named mode. I really need to find those two remaining logos. Nice score. I timed out the level 4 & 5 bosses, and I try to kill the 3rd boss and never can. I assume at that level in the game, that's a shitload of points. 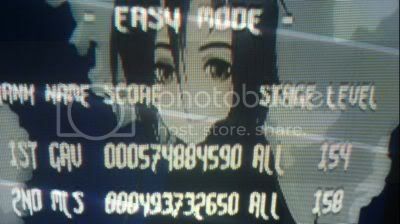 All of the bosses are worth significant points given the score ranges for the stages. For the later bosses, use sword exclusively (try to get it up to level 50 by the end of stage 3 so that you have the triple swing). For the first stage 3 boss (the tower), use the DFS and point-blank those bushes with sword, you should be able to destroy most of them before the DFS wears off. Pull back as the DFS fades and start firing. You should have a full DFS meter now. Repeat the process. You should be able to pull off two or three cycles before there are a handful of targets left and your meter doesn't refill enough. Just hang back and sit still. Don't fire or swing, just let your shield absorb everything until you hit full DFS again. Now march in and finish off the tower. For the blue mech, get up close and start swinging. You should be able to knock off at least a third of his health before he starts firing. Just pull back and throw up your shield until you get a full DFS meter and then charge in using that and swinging. Repeat until he's dead. Remember that for the last 5 or 6 seconds before he escapes, he doesn't fire. You can just sit on top of him swinging which should be enough to kill him. Vast majority of my points came in the third stage, especially the boss. I think I was only at 120-odd million after stage 2. Last edited by gavin19 on Thu Mar 15, 2007 9:53 am, edited 1 time in total. Where are you guys getting that other 100-200 million points from? Are you leveling up you weapons evenly to maximize the multipler? Or are there some boss milking techniques that I'm not aware of. How the hell do you play this game? Its confusing! you'll have better luck asking this in the discussion thread rather than the high score thread. Here is a clip one of the board members made to briefly explain the game. I mostly concentrate on Sword, then a little Shot and no Shield. Points breakdown is usually around 22 (St1), 125 (2), and 520 (3) million. Milking bosses definately helps boost the score, but there's always that fine line between milking and timing them out. I'm assuming Kiken's much higher score is down to him progressing his shield too as he said he does in Normal/Hard. Also my Levels would be usually 60, 110, 160 for Stages 1, 2 and 3 respectively. Kiel - easy - 440,587,000 - all - ? Kiel - Normal - 760,261,220 - all - ? Not a huge improvement, but I did manage to finally make the stage 4 logo appear. BTW, I recorded this run... should I go ahead and post it (even though it's far from perfect)? Yes please I was looking for some footage for a long time. Any footage of Normal/Hard mode would be much appreciated. The levels themselves aren't the problem (as with Radilgy), it's the bosses that get me. What a help watching a quality replay does for your score! After watching Kiken's Stage 3,4 and 5 replays I added 1 billion (!) to my previous best, as you can see from the pic. Should have had a 1cc though. Last boss at 1/4 energy and I inexplicably swung my sword when I should have sat with my shield up. Ah well, next time. Slightly better but I got greedy on the last boss and paid for it.